For the third night running, there have been protests in Charlotte, North Carolina over the fatal shooting of a black man by a black police officer. 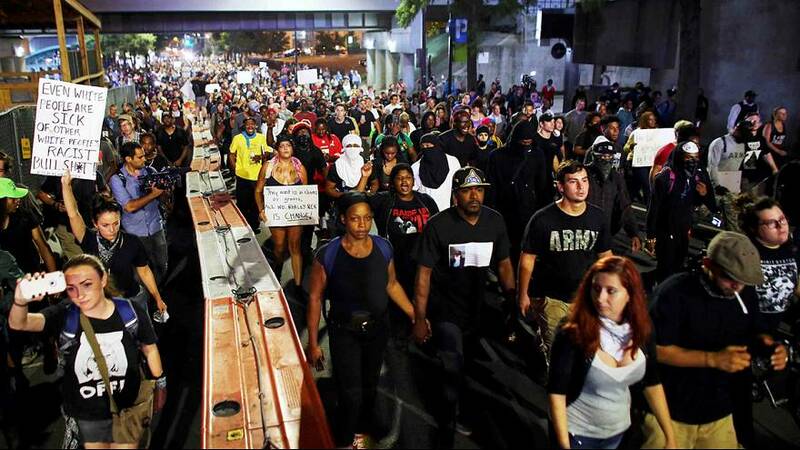 But in contrast to previous nights, Thursday’s demonstration in the US city was largely peaceful. Authorities imposed a midnight curfew to try to avoid a repeat of Wednesday’s riots in which a man injured during gunfire later died of his wounds. Protesters on Thursday remained defiant – insisting they are all at risk of police violence. “I have one sibling and he is my brother and I feel like it is my duty to protect him,” said Joya, a local protester. “I will try to work with the ministers that are out here and try to get people to comply because they have done so well thus far,” said Charlotte pastor and activist Shawn Elliot Richardson, speaking about the curfew. Protesters refused to respect the curfew. But it was not enforced, given the relative calm. Rejecting claims that he was armed, relatives of Keith Lamont Scott have seen footage of his shooting and want it made public – something that police have so far refused to do. The videos show Scott was calm, acting in a non-aggressive way and walking slowly backward with hands by his sides when shot by police on Tuesday, the family’s lawyer said in a statement, but it was unclear if he was holding a gun, as police say. The family have previously said Scott was holding a book. This is the latest death to stir passions over the police use of deadly force against black men in the United States.